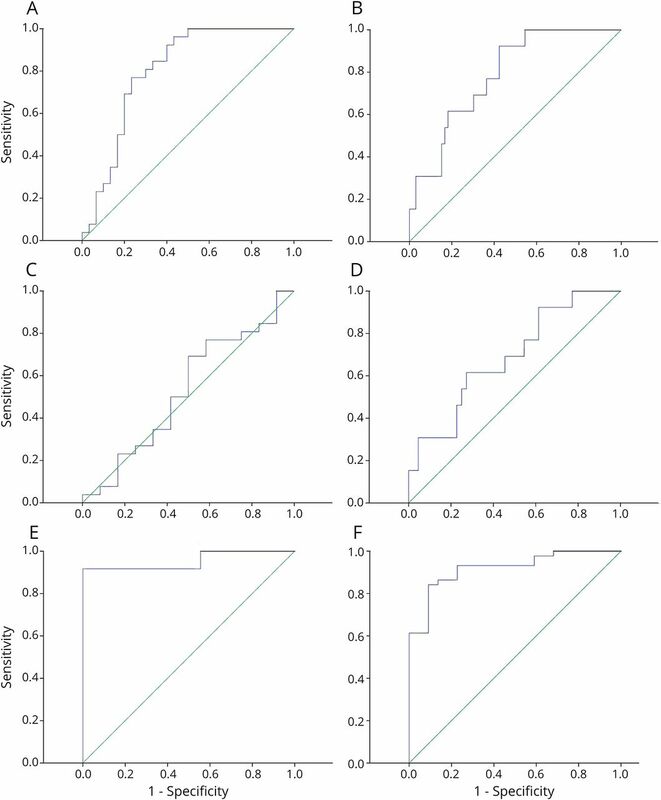 (A and B) ROC analysis indicated that ASFMR1-TV2 has a good discriminating power of FXTAS when comparing FXTAS with PMC and normal in men (A: AUC = 0.80; 95% CI = 0.68, 0.92) and women (B: AUC = 0.80; 95% CI = 0.67, 0.9). (C and D) ROC analysis indicated that ASFMR1-TV2 did not have a good discriminating power when comparing FXTAS with PMC in both men (C) and women (D) (men: AUC = 0.53, 95% CI = 0.32, 0.74; women: AUC = 0.69, 95% CI = 0.53, 0.85). (E and F) ROC analysis indicated that ASFMR1-TV2 has a good discriminating power when comparing PMC without FXTAS with normal in both men (E) and women (F) (men: AUC = 0.95, 95% CI = 0.86, 1; women: AUC = 0.92, 95% CI = 0.85, 0.99). (A–F) The green line is the diagonal reference line, and the blue line is the empirical ROC curve comparing FXTAS with NCs and premutation carriers (A and B), FXTAS with PMC (C and D), and PMC without FXTAS with controls (E and F) (The closer the ROC curve gets to the reference line, the worse the test. A large value of the AUC indicates a good test. An area of 1 means a perfect test, and 0.5 represents a worthless test). AUC = area under the curve; ASFMR1-TV2 = antisense fragile-X mental retardation-transcript variant 2; CI = confidence interval; FXTAS = fragile X-associated tremor/ataxia syndrome; NC = normal control; PMC = premutation carrier; ROC = receiver operating characteristic. Defining characteristic of ASFMR1-TV2. There is an 84-nt deletion at near the beginning of the ASFMR1 ORF that has an enhanced expression compared with a healthy control. 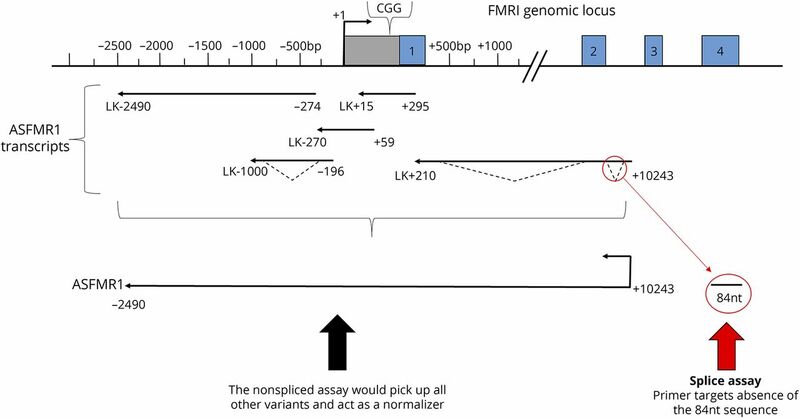 We designed strand specific primers that target the presence and absence of the 84-nt sequence to determine the fold increase relative to GUS expression for ASFMR1-TV2 spliced and nonspliced assays. ASFMR1-TV2 = antisense fragile-X mental retardation transcript variant 2; FMR = fragile X mental retardation; nt = nucleotide; ORF = open reading frame.